Lotus flowers are well known for their enigmatic beauty and the way they transform the look of the often dark and murky ponds they flower in. They have been symbols of many different things to different cultures - from being a symbol of purity and beauty in the Buddhist and Hindu religions, whilst the Ancient Egyptians saw tham as a symbol of rebirth and the sun because their scholars beleived that the lotus closed its flower and sank back into the pond during the night. 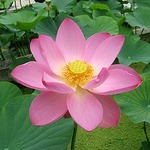 Whatever the symbolism, the Lotus Flower is somewhat of an icon in its own right. And our party sharing bowl celebrates that in a very unique but preactical way. Each and every one is hand crafted with incredible detail and accuracy to create a truly bespoke and eye catching way for a number of people to share the contents of the central bowl whether it be crisps, nuts or soemthing slightly more exotic. You'll have seen from the image and video here that the individual Lotus leaf bowls can be removed to hold whatever nibbles take your fancy allowing you to move around freely and socialise whilst indulging yourself with your favourite snack. There is an ornately carved bowl incorporated as the central part of the flower with a lift off lid and good room for storage. Each and every part is finished with a light resin to add further character and make maintaining the party bowl easy. Such a pretty design, looks lovely for family events or parties, everyone asks where i got it from.